The Montezuma Quail is a tiny bird of Mexican mountains and the Southwestern US. It appears boldly colored in the open but disappears into the brush as if invisible. Habitat loss and overgrazing have diminished the bird’s range, but conservation agencies have been working together to protect it. We’re in the Davis Mountains of Southwest Texas, the landscape dotted with oaks. [quail] An eerie trill erupts from the foot-tall grass. It’s the Montezuma Quail, a tiny, ornately patterned bird named for the Aztec ruler. Rows of bright white spots line the quail’s black flanks. Its back is crosshatched with shafts of gold. And elegant swirls of black adorn its white face. The quail’s markings are bold and beautiful. But watch it hunker down on a carpet of fallen oak leaves, or rest among lichen-covered stones, and it disappears into the brush as if invisible. The Montezuma Quail is a secretive bird and a scarce one. Few birds are more highly sought after by birders visiting the Southwest. Mostly a bird of Mexican mountains, it reaches just into the southwestern United States. Habitat loss and overgrazing have reduced the range of this little bird. 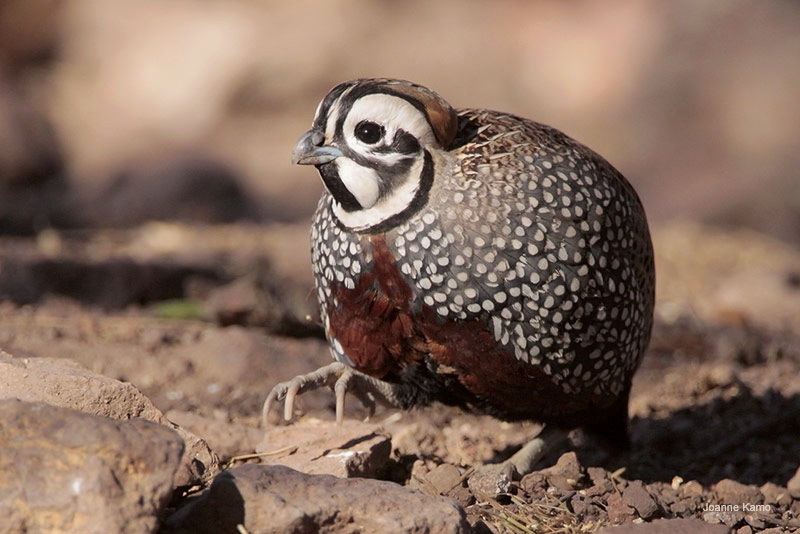 Without the right brush to hide in, the quail’s camouflage isn’t nearly as good. But it still holds its own in areas protected by The Nature Conservancy, Texas State Parks, and national forests in Arizona and New Mexico.